Officials say a fire that was extinguished after burning for days at a Houston-area petrochemicals storage facility briefly flared up. The blaze in Deer Park had been extinguished at 3 a.m. Wednesday. But the city of Deer Park said in a tweet in the late afternoon that there was a small flare-up of the blaze. The flare-up, which sent flames and smoke into the air, was contained within 30 seconds by firefighters. Robert Hemminger, Deer Park’s emergency services director, says flare-ups are expected with fires of this scale. Intercontinental Terminals Company officials didn’t immediately return calls or emails seeking comment. An ITC spokeswoman said earlier Wednesday that crews would continue spraying foam and water on tanks that caught fire to cool them down and prevent the blaze from reigniting. 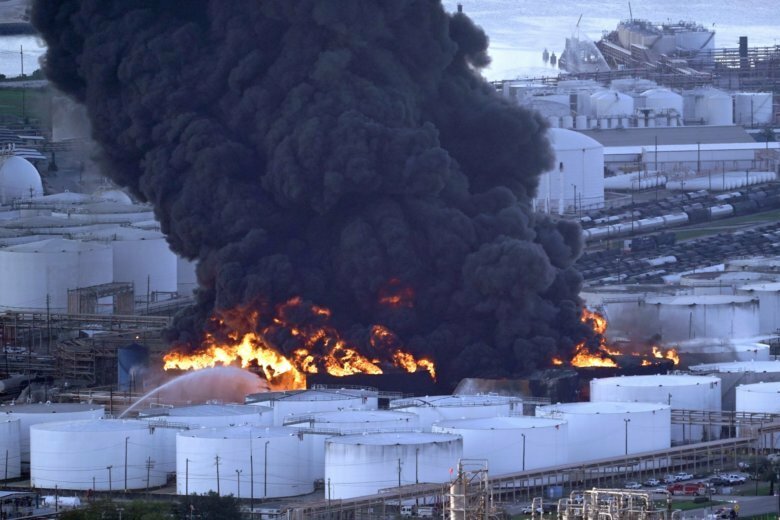 Some residents and environmental and community groups have concerns following a fire at a Houston-area petrochemicals storage facility despite reassurances from officials that the air quality is safe. The fire in Deer Park was extinguished at 3 a.m. Wednesday. It began Sunday at the facility southeast of Houston, sending a huge, dark plume of smoke thousands of feet in the air. The Environmental Protection Agency says its testing shows the air quality to be within acceptable levels. Bryan Parras, with the Sierra Club, says some residents have reported various symptoms since the fire, including headaches and nausea. Crews that extinguished a fire that burned for days at a Houston-area petrochemicals storage facility are now cleaning up the site. Intercontinental Terminals Company spokeswoman Alice Richardson said at a Wednesday news conference the cleanup efforts will allow workers to reach the site and begin the investigation into what caused the blaze. Richardson says crews will continue spraying foam and water on tanks that caught fire to cool them down and prevent the blaze from reigniting. The tanks contained components of gasoline and materials used in nail polish remover, glues and paint thinner. Adam Adams with the Environmental Protection Agency says testing shows the air quality remains safe. Crews have extinguished a fire that’s burned for days at a Houston-area petrochemicals storage facility. Intercontinental Terminals Company says the blaze in Deer Park was extinguished as of 3 a.m. Wednesday. The fire began Sunday at the facility southeast of Houston, sending a huge, dark plume of smoke thousands of feet in the air, though officials said air quality remained safe.